These recordings, which may be the first recordings ever made of Frost, in one sense mark a departure from the aesthetic circumscription of the collection. Many of the poets who were recorded in professors W. Cabell Greet and George W. Hibbitt’s Columbia University lab built for the study of American dialects operated in a modernist tradition of formal innovation. From the collection’s founding with the performance-forward, Dada-esque incantations of Vachel Lindsay through James Weldon Johnson’s Afro-Modernist scoring of speech sounds and Gertrude Stein’s proto-Language poetics, it’s clear that the editors favored a particular strain of modernism. And Frost’s emphasis on sound comes through clearly in these twenty-one recordings. Perhaps most striking is his performance of “The Code,” of which there are two takes. The poem, which spans both sides of an aluminum record because its length exceeds the capacity of a side, portrays Frost at the height of his performativity in this collection. As Frost tells the frame story of a migrant farm laborer recounting to his current employer the time he almost killed his previous employer, he enacts memory’s ability to reinscribe trauma through his performance. The aural mise-en-scène is crafted through Frost’s application of regional dialect, foregrounding the localism of the worker and dampening his accent for his performance of a generic employer. Frost also applies dialect to express meaning in both recordings of his much-celebrated “Mending Wall.” In both recordings, recorded over a year apart, the sound that underwrites the poetics is clear as Frost presents the neighbor’s famous dictum in a liberally applied drawl: “Good fences make good neighbors.” He performs the neighbor’s line in exactly the same alternate dialect each of the four times that he speaks it (two in each recording). The lilting and slowed prosody of the delivery exposes explicitly the politics that underlie the poem: the desire to fence in, to stop time and preserve the present moment against an encroaching fluidity is enacted by both the content and form. The repetition of a stale dictum inherited from the neighbor’s father’s age represented by a slowed delivery (an effort to slow time) pull hard against the poem’s speaker’s faster-paced speech, in which he seeks to move with (or faster than?) time, to dissect and lay bare what is behind the inherited axiom. These are just a couple of examples where we can see Frost’s interest in the American idiom, one that links him to another poet recorded in the series, William Carlos Williams, and much more could be said about how Frost's interest in regional dialects intertwines with those of the linguists who were series’s editors. 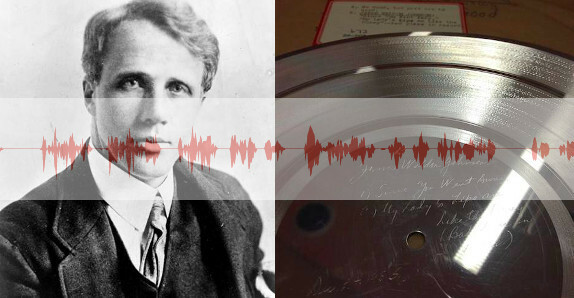 A final bonus in the collection is a recording of Frost reading his poem “On the Heart’s Beginning to Cloud the Mind” in lieu of a speech at the Pulitzer Prize dinner in 1937, the year he won the Pulitzer for A Further Range. The reading was broadcast over the radio, and Greet recorded it with his aluminum-record cutter, as he was fond of doing. In fact, the overall collection of Greet and Hibbitt’s recordings, in addition to poetry and dialect samples, includes many radio recordings, such as FDR addressing the country. And this was actually the reason for the invention of the one-off aluminum-record cutters: for ad agencies to record and examine how their ads played on the radio. For more information on the Speech Lab Recordings, see my essay "Provenance Report," and my forthcoming essays in the Chicago Review (on the Lindsay recordings) and Oral Tradition (on the James Weldon Johnson recordings). We at PennSound wish to sincerely thank Lesley Francis, Robert Frost’s granddaughter, for helping us to make these materials available. We also thank the Robert Frost Estate and Henry Holt and Co. for the permission to post these recordings. And we are grateful to the staff at the Columbia Rare Book and Manuscript Library for their ongoing help.